This one came with such glowing recommendations that I was delighted to see it sitting there on the shelf all shiny and mysterious and earlier than expected on my last trip to the bookstore. Seriously, it seemed to glow at me from within. It could have just been the flourescent light glancing off the cover but, either way, it was a pretty promising start to a great read by debut author Kristin Cashore. 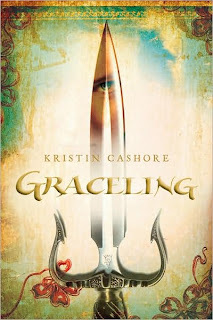 Graceling is the story of a young woman named Katsa. Katsa's life is made difficult by the fact that she is a member of an unwelcome minority known as the Graced. The Graced possess certain enhanced natural abilites such as the ability to swim like a fish or sing like a bird and no two Gracelings have the same ability. These almost superhuman traits set them apart from the whole of society and they are viewed in a highly negative light. Unknown quantities. Not to be trusted. Too make it worse, Katsa has a killing Grace. She can dispatch bad guys like nobody's business. Trouble is she's in servitude to her uncle, a rather nasty bit of work who trots her out to do his dirty work anytime he feels one of his underlings isn't performing up to snuff. Katsa hates her Grace, despises her uncle, and lives in fear of losing her temper one day and unleashing an absolute massacre. Katsa is a steely young woman who has few friends and fewer joys in her life. Graceling follows her struggles to control her Grace, define its boundaries, and find purpose in a world that does not seem to want her in it. Kristin Cashore excels at the storytelling, wrapping her hardened heroine in a cloak of beautifully urgent language. She knows how to pace her plot and particularly how to end a chapter in just such a way so the reader is both satisfied and eager for more. No easy task, that. The climax of this book ran shivers down my spine and the choices the characters were forced to make both broke my heart and made me proud of them. If you are a fan of Tamora Pierce or Robin McKinley, this one is pretty much a guaranteed home run. Graceling is also the first in a trilogy, although it sounds like the second installment, Fire, is actually a prequel. I have been looking for this book in my area, to no avail! Tamora Pierce AND Robin McKinley comparisons? *click*<--the sound of this book being added to my amazon shopping cart. Thanks, Thea. I don't think you'll be disappointed. I'm looking forward to what Kristin Cashore does next in this world. Oh wow - you've made me excited about this book now! Will def look out for it. Excellent. My work here is done. I just read a review of Graceling on Fantasy Book Critic then came here and read yours. Between the two reviews, I'm convinced that I need this book. Wow, that was a very detailed review! Yeah, I'd say it's a keeper. Wonderfully written review, Angie. I saw this book reviewed on another blog several weeks ago and immediately decided I wanted to read it. Now you're review has me wanting to go to the bookstore and get it right now! A love novels that are centered on strong, young heroines. I know one shouldn't judge a book by the cover, but this cover sure is striking! .... that should be your review and I love novels. Lol. One of those days, Christine? I'm having one myself. And the cover of Graceling is even more striking in person. I quite simply could not walk out of the bookstore without it. And Katsa was everything I hoped she would be.